DayLynn Contreras and Angelica Perez have a channel called "Jelly and Day" which uses FameBit to make money with their videos. DayLynn Contreras of Austin, Texas, has a full-time job as a programmer, but she's counting down the months until she can devote herself to creating YouTube videos. Since December 2014, Contreras has been using a service called FameBit to make that a financial possibility. FameBit is a marketplace for brands and YouTube creators to form business deals. Brands post products they want used in YouTube videos. Video creators bid how much they'll do the job for, and brands select the best candidates. "The biggest [YouTube] stars are quite visible, but anyone in the mid-scale can be hard to find." said FameBit co-founder Agnes Kozera. Kozera said that while some of the top YouTube sensations might have 10 million subscribers, brands can achieve that same reach by working with several lesser known YouTube creators..
"You hit that same reach and you have a lot more content," said Kozera, who said users can get paid anywhere from a minimum of $100 to upwards of $20,000. "[While] it's awesome to have that one viral video with a giant star -- it can be a hit or miss." The Santa Monica-based FameBit, which launched to the public in May 2014, now works with over 1,000 brands, some as big as Adidas and L'Oreal or as small as DogVacay. FameBit says 8,000 YouTube creators, with a combined audience of 300 million viewers, are using their service. 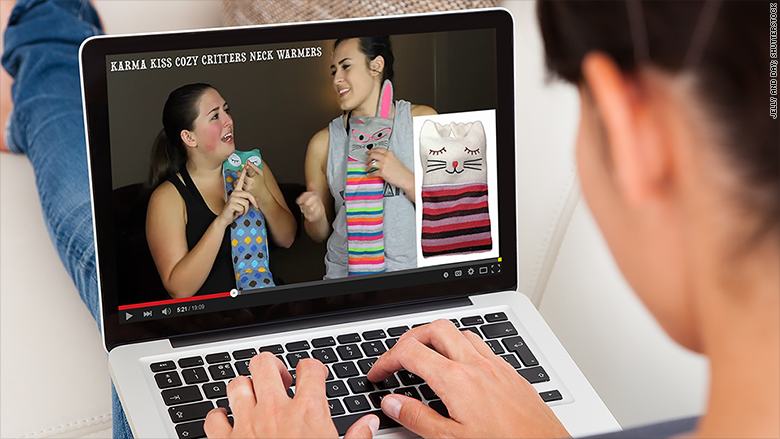 Contreras, 22, runs a a channel called "Jelly and Day" with her fiance Angelica Perez, 23. The channel has just over 100,000 subscribers, but hadn't made any significant amount of money until recently. They were getting paid a minor amount each month through a partnership with YouTube network, Full Screen. Contreras said it was "definitely not enough to live on." Since joining FameBit, "Our whole world has turned upside down," Contreras said. Among their light hearted videos on their Jelly and Day channel is a monthly "favorites" video which incorporates up to 15 products from brands paying them via FameBit. Each advertiser pays them an amount which typically ranges from $200 to $2,000 depending on their bid. "We only apply to brands that we'd actually use," Contreras said, which helps make the brands look less like an advertisement and more authentically integrated into the videos. There's a lot of competition to win a bid -- which Contreras said they've had a lot of success with because they tend to low-ball a lot of brand, something they're able to do if they're incorporating many brands into one video. "It's like a game," she said. "I saw the Selfie Stick on FameBit. I just wanted it, so I said $50 and I got the stick." Together, the two have earned roughly $4,000 a month. Plus, they get to keep the products. Though they're new to the service, that monthly rate was enough for Perez to quit her full-time job as an executive assistant this week. Contreras hopes to follow suit in the coming months and she closely monitors her FameBit account for new postings while at her day job. "I refresh [the webpage] every hour," she added. "Literally." Its users aren't the only ones profiting. Kierzkowski said FameBit -- which has raised $1.5 million in funding from investors like Science and 500 Startups -- is already profitable. The startup takes a 20% commission on all deals, plus offers a VIP service, which offers additional support for larger brands. Kierzkowski declined to disclose specifics on financials but confirmed that the firm, which has a team of 13, grossed over $3 million in 2014.